AngloGold Ashanti, Yamana Gold, IAMGOLD, and Eldorado Gold weren't feeling the love last month. Despite auspicious starts to the new year, many of the market's largest gold stocks fell in February, including AngloGold Ashanti (NYSE:AU), Yamana Gold (NYSE:AUY), IAMGOLD (NYSE:IAG), and Eldorado Gold (NYSE:EGO). Rising approximately 4% through the month, the price of gold doesn't seem to be responsible for the stocks' movements, so there must be other factors at play. Providing testimony to the House Financial Services Committee last month, Fed Chair Janet Yellen suggested the American economy was faring well -- something she supported by reiterating her expectation that the Fed will raise interest rates three times this year. It's no wonder, then, that gold stocks -- which generally rise when fear and uncertainty are high -- reacted adversely. Let's take a closer look to see what other factors, besides Yellen's comments, affected the stocks' declines. In its fiscal 2016 earnings released in February, AngloGold Ashanti had several things to celebrate from its performance last year. For one, the company strengthened its balance sheet, ending fiscal 2016 with $1.92 billion in net debt -- a 13% reduction compared to the end of fiscal 2015. Further illustrating the improvement, AngloGold Ashanti now has a net debt-to-adjusted EBITDA ratio of 1.24 -- a more sound financial position than the 1.49 and 1.94 ratios it had at the end of fiscal years 2015 and 2014, respectively. In addition to the balance sheet, its cash flow statement also reflected some improvement. The company reported $278 million in free cash flow for fiscal 2016 -- a 97% year-over-year improvement. As bright as the earnings report shone in several areas, it wasn't enough to stave off the stock's 12% slide through the month. Besides Yellen's comments, investors were likely reacting to the company's apparent inability to control its expenses. In fiscal 2016, management reported all-in sustaining costs (AISC) of $986 per gold ounce -- an 8% increase over the $910 AISC, which it reported in the previous year. Perhaps most disheartening to investors, though, was the forecast for fiscal 2017; management expects AISC to total $1,050 to $1,100 per gold ounce. Like AngloGold Ashanti, Yamana Gold also reported its fourth-quarter and fiscal 2016 earnings in February, where it revealed several ways in which the company shone brightly. Growing its EBITDA, Yamana Gold reported $604 million in fiscal 2016, representing 19% growth over the $507 million, which it reported for fiscal 2015. The EBITDA growth appears even more impressive when considering the margin expansion that goes along with it. Whereas its EBITDA margin as a percentage of revenue was 29% in fiscal 2015, it was 34% in fiscal 2016. But, also like AngloGold Ashanti, Yamana Gold's investors were moved more to act -- not by the real achievements of the past year but by the presumed challenges of the years ahead. Eschewing growth through acquisition in the near term, the company intends to remain self-reliant in pursuing growth. According to a press release that addressed Yamana Gold's 2017 to 2019 outlook, the company "is currently in an organic growth phase, whereby it is focusing on the numerous internal opportunities under evaluation." Despite a strong start to the year -- shares rose 12% in January -- the market reversed course on IAMGOLD in February, sending shares down more than 14% through the month. Like its peers, IAMGOLD had several causes for celebration related to its fiscal 2016 earnings report in comparison to the prior year: Revenue rose 8%, operating cash flow skyrocketed more than 720%, and AISC fell 5.5% to $1,057 per gold ounce. So where did investors find fault? For one, the company reported capital expenditures of $270 million for fiscal 2016 -- 41% higher than the $191 million it reported in the previous year. More disheartening to investors, though, was its AISC forecast for fiscal 2017 -- $1,000 to $1,080 per gold ounce. Though management seems to be optimistic the company will rein in costs in the year ahead, the truth is that its AISC remains one of the highest among its peers. And yet another cause for the stock's drop in February could have been the decisions of fellow gold miners Barrick Gold (NYSE:GOLD) and Newmont Mining (NYSE:NEM) to revisit their dividends -- salt in the wounds of IAMGOLD's shareholders since IAMGOLD suspended its dividend in December 2013. Raising its quarterly dividend 50%, Barrick Gold will now return $0.03 per share to investors. Newmont Mining will also be showing its investors more love, raising its quarterly dividend to $0.05 per share -- twice as much as it paid out in the same period last year. Like its peers, Eldorado Gold lauded several achievements in its fiscal 2016 earnings report. It successfully reduced its AISC to $900 per gold ounce -- well below its guidance of $940 to $980 per gold ounce. Further inspiring investors, the company provided fiscal 2017 guidance for AISC: $845 to $875 per gold ounce. And working to optimize its portfolio, it divested its Chinese assets, generating proceeds of $882 million. But the company had its share of challenges, too. For one, it reported gold production of 486,000 ounces, which was lower than the revised third-quarter estimate of 495,000 ounces. Also, Eldorado Gold continued its suffering from contracting margins. Reporting $198 million in EBITDA from revenue of $650 million, Eldorado reported an EBITDA margin of 30% -- a further drop from the 46%, 44%, and 34%, which it reported in fiscal years 2013, 2014, and 2015, respectively. Dealing with both complicated fiscal 2016 earnings reports as well as Ms. Yellen's comments before the House Financial Services Committee, gold investors had plenty to dig through in February -- and they clearly didn't like what they uncovered. 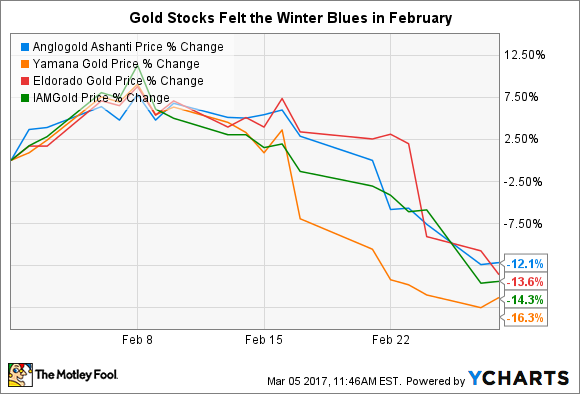 Despite the price of gold rising more than 4% through February, gold stocks erased most of the gains they made in January. Moving forward, it will be interesting to see what the Fed announces in its next meeting on March 14 and 15 and how -- if at all -- gold stocks will react. It's likely that the market has already priced in a rate hike, so it wouldn't be surprising if the Fed announces a raise in interest rates. However, gold stocks would be unaffected.